Ptosis repair surgery is a procedure whereby the eyelid muscle is tightened to lift its height, open the eye, and improve appearance and vision. Ptosis surgery is a specialized form of eyelid surgery which is generally only performed by eyelid surgeons only. These specialists are called oculoplastic surgeons or ophthalmic plastic surgeons. They are accredited by the American Society of ophthalmic Plastic and Reconstructive Surgery (ASOPRS). Only an ASOPRS trained physician should perform your ptosis repair surgery. Ptosis repair surgery is different than blepharoplasty surgery (traditional lid lift) in that it does not remove skin/muscle and fat. Rather it lifts the height of the eyelid. This is more complex surgery which is why an eyelid specialist is needed. Dr. Guy Massry is an ASOPRS trained oculoplastic surgeon who practices in Beverly Hills, California. Eyelid surgery is very common in Beverly Hills as so much cosmetic surgery is performed in this city. For this reason many Beverly Hills surgeons see patients with ptosis. However, only a select few perform ptosis repair surgery. 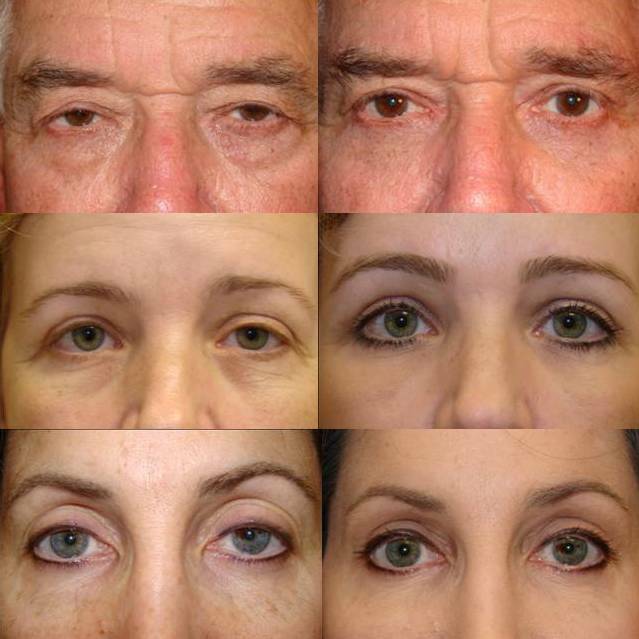 Below are examples of patients who had ptosis surgery.